respect, trust and humility, I write to you this proposaL I am 'ff. Ed\v.rrd Kamal the son of 'ff. You may be surprise to receive this mail since you don't know me personally, but with due respect, trust and humility, I write to you this proposal. 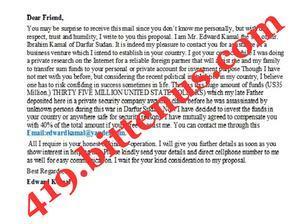 I am Mr. Edward Kamal the son of Mr. Ibrahim Kamal of Darfur Sudan. It is indeed my pleasure to contact you for assistance of a business venture which I intend to establish in your country. I got your contact while I was doing a private research on the Internet for a reliable foreign partner that will assist me and my family to transfer sum funds to your personal or private account for investment purpose Though I have not met with you before, but considering the recent political instabilities in my country, I believe one has to risk confiding in success sometimes in life. There is this huge amount of funds (US35 Million.) THIRTY FIVE MILLION UNITED STATE DOLLARS) which my late Father deposited here in a private security company awaiting claim before he was assassinated by unknown persons during this war in Darfur Sudan. Now I have decided to invest the funds in your country or anywhere safe for security reasons. I have mutually agreed to compensate you with 40% of the total amount if you agree to assist me. You can contact me through this Email:edwardkamal@yandex.com. All I require is your honest & kind co-operation. I will give you further details as soon as you show interest in helping me. Please kindly send your details and direct cellphone number to me as well for easy communication. I greet you in name of the LORD Almighty the giver of every good thing. Good day and compliments of the seasons. I thank you so much for your urgent reply, please consider my request as a divine wish and accept it with a deep sense of humility. I am giving you my trust and wish you will give me back the trust i have given to you. I believe that you will be Honest to fulfill this divine project of investment. My Later deposited this fund in a finance and security firm in South Africa before his death,am currently in South Africa now as a refugee and their law do not permit me to invest such Hugh fund as a refugee status that is why i contacted you. Please I will like you to contact my banker with his contact Email information below to carry out the transfer process. This is my banker contact details below. Contact Him immediately for more information. BANK NAME: FIRST NATIONAL BANK OF SOUTH AFRICA. Please notify me of your communication with him to enable us work in hand to hand for he success of this investment, my banker is a very good and kind man; He is waiting for your email. Please kindly send your direct cellphone number to me for easy communication.